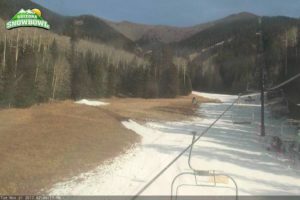 FLAGSTAFF, AZ — Despite having no natural snow, Arizona Snowbowl has opened a handful of runs at their controversial ski area with snow made from 100% treated sewage on the San Francisco Peaks. A Mountain Protector Rally is being held to address environmental issues, public health concerns, and ongoing religious freedoms violations of the 13 Indigenous Nations who hold the Peaks sacred. Arizona Snowbowl operates their private business on the Peaks under permit from the US Forest Service. The Forest Service approved ski area expansion and treated sewage snowmaking in 2005. 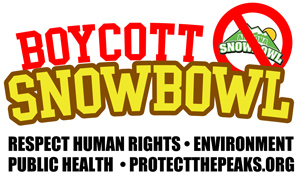 Lawsuits by environmental groups and Indigenous Nations ultimately failed and Snowbowl started making treated sewage snow in 2012. 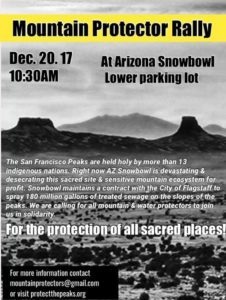 The Hopi Tribe is currently in litigation with the City of Flagstaff over the city’s contract to sell wastewater to snowbowl. Flagstaff taxpayers are subsidizing Snowbowl’s reclaimed wastewater use for dirty snow. The cost to produce reclaimed wastewater is $1.94/1,000gal, yet it is sold to Snowbowl for a meager $ .96/1,000gal, potable water users make up the dollar difference. When: Wednesday, December 20, 2015 at 10:30 AM. Meet at lower Humphrey parking lot.